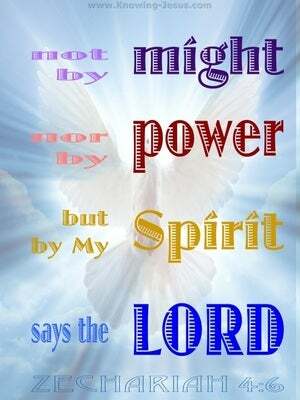 ﻿ Zechariah 4:6 Then he said to me, "This is the word of the LORD to Zerubbabel saying, 'Not by might nor by power, but by My Spirit,' says the LORD of hosts. So he answered me, "This is the word of the Lord to Zerubbabel: 'Not by strength or by might, but by My Spirit,' says the Lord of Hosts. Then he replied to me, "This is this message from the LORD to Zerubbabel: "Not by valor nor by strength, but only by my Spirit,' says the LORD of the Heavenly Armies. 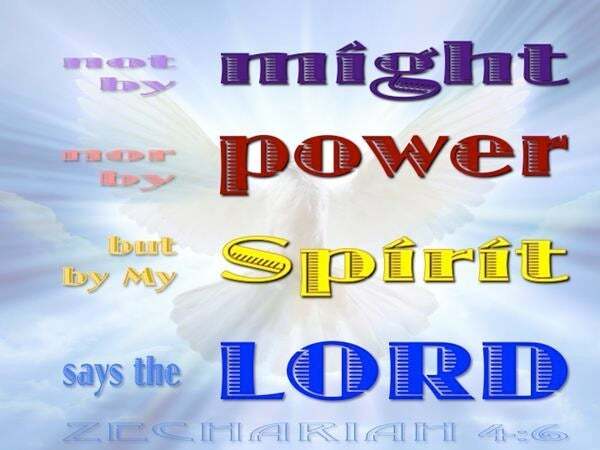 Then he answered and spoke to me, saying, This is the word of LORD to Zerubbabel, saying, Not by might, nor by power, but by my Spirit, says LORD of hosts. Then he answered and spake unto me, saying, This is the word of Jehovah unto Zerubbabel, saying, Not by might, nor by power, but by my Spirit, saith Jehovah of hosts. 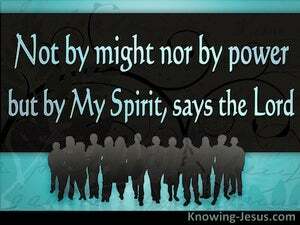 This is the word of the Lord to Zerubbabel, saying, Not by force or by power, but by my spirit, says the Lord of armies. And he will answer And say to me, saying, This the word of Jehovah to Zerubbabel, saying, Not by strength, not by power, but by my spirit, said Jehovah of armies. Then he answered and spoke unto me, saying, This is the word of the LORD unto Zerubbabel, saying, Not by might, nor by power, but by my spirit, says the LORD of hosts. And he answered and said to me, "This [is] the word of Yahweh to Zerubbabel, saying, 'Not by strength and not by power, but [only] by my Spirit,' says Yahweh of hosts. Then he answered and spoke to me, saying, This is the Word of Jehovah to Zerubbabel, saying, Not by might, nor by power, but by My Spirit, says Jehovah of Hosts. He answered, and said unto me, 'This is the word of the LORD unto Zerubbabel, saying: Neither through a host of men, nor through strength, but through my spirit, sayeth the LORD of Hosts. Therefore he told me, "These signify the word of the Lord to Zerubbabel: 'Not by strength and not by power, but by my Spirit,' says the Lord who rules over all." Then he answered and spoke to me, saying, "This is the word of the LORD to Zerubbabel, saying, 'Not by might, nor by power, but by my Spirit,' says the LORD of hosts. Then responded he, and spake unto me, saying, This, is the word of Yahweh, unto Zerubbabel, saying, - Not by wealth, nor by strength, but by my spirit, saith Yahweh of hosts. 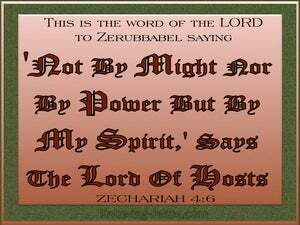 Then he answered and spoke to me, saying, This is the word of the LORD to Zerubbabel, saying, Not by might, nor by power, but by my spirit, saith the LORD of hosts. Then he answered and spoke to me, saying, "This is the word of Yahweh to Zerubbabel, saying, 'Not by might, nor by power, but by my Spirit,' says Yahweh of Armies. And he answereth and speaketh unto me, saying: 'This is a word of Jehovah unto Zerubbabel, saying: Not by a force, nor by power, But -- by My Spirit, said Jehovah of Hosts. 5 So the angel who was speaking with me answered and said to me, "Do you not know what these are?" And I said, "No, my lord." 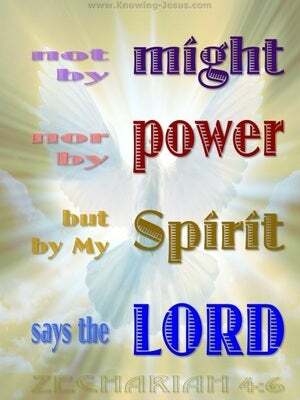 6 Then he said to me, "This is the word of the LORD to Zerubbabel saying, 'Not by might nor by power, but by My Spirit,' says the LORD of hosts. 7 'What are you, O great mountain? Before Zerubbabel you will become a plain; and he will bring forth the top stone with shouts of "Grace, grace to it!"'" For I will bend Judah as My bow, I will fill the bow with Ephraim And I will stir up your sons, O Zion, against your sons, O Greece; And I will make you like a warrior's sword. It was revealed to them that they were not serving themselves, but you, in these things which now have been announced to you through those who preached the gospel to you by the Holy Spirit sent from heaven--things into which angels long to look.